This week's podcast was inspired by my own recent experiences. This year I've had a surgery and a few other health checkups, so I wanted to touch on feng shui and how it can help out with health. As with most feng shui, the mundane actions matter more, but there are ways to increase your health with adjustments! Hopefully you won't need many of these adjustments, but if you do find yourself facing health issues or concerns, try a few feng shui options along with the necessary medical actions! As always, thank you for listening to the Holistic Spaces podcast! For more tips and insight on feng shui, green design and holistic living, sign up for our monthly newsletter. If you have specific questions, feel free to reach out for an answer on our Q&A Sunday series or schedule a 15-minute consultation call. You can also support the podcast by visiting Patreon and pledging as little as $1 / month to help keep the episodes coming. Finally, don't forget to review the podcast on iTunes and let us know for a chance to win a free mini consultation! Good luck! I'm excited about this episode, as I'll be sharing a mini telephone consultation with a client in Chicago who sent in her floor plan. Listen in as Jennifer and I discuss how she can make adjustments to her space to enhance knowledge. I hope you enjoyed listening in on this consultation! I'm happy to have shared a bit of the individual feng shui experience with you. Of course, feng shui is a very personal practice, some of the adjustments we discussed work for you as well! You can read more about many of these cures on the Holistic Spaces blog. As always, if you have questions, we encourage you to submit (like Jennifer did!) for our Q&A Sunday, and sign up for the Holistic Spaces newsletter for tips on green design and feng shui, PLUS a 10% off coupon to HolisticSpaces.com! This week: feng shui in the bedroom. Your bedroom is very important, symbolically, in feng shui, and how you design and arrange it can make a big difference on how you feel from day to day. What does your bedroom represent? This week, try to make at least one adjustment in your bedroom space, even if it’s just as simple as cleaning out the storage under your bed. You might be amazed at how much better your space feels when you make these small adjustments. Tune in October 26 for the next Holistic Spaces Podcast: New Beginnings, Abundance and Health, the first of a series of three episodes focused on the bagua map. This week, we’ll talk about feng shui for your desk. The back to school season is in full-swing, and chances are, work is picking back up too. How can you make adjustments to your workspace to maximize the energy of your day? What does your desk represent? You most likely spend a lot of time at your desk and on your career, so why not make sure you’re inviting abundance, focus and healthy relationships into your work? Take a look at your desk now. Is it positioned for positive energy? Can you add focus or make any other adjustments? Tune in October 12 for the next Holistic Spaces Podcast: Feng Shui for Your Bedroom! Welcome to the very first episode of the Holistic Spaces Podcast! Listen in this week to learn about the basics of feng shui, including what it is, where it came from, how it started and the importance of the commanding position. What is the Commanding Position? Where does the Commanding Position originate? If you have some time this week, take a look at your space and see where your furniture and appliances are placed in relation to the door. Are you in the commanding position? If not, can you move your bed, desk or stove? Do you need a mirror or mirrors? 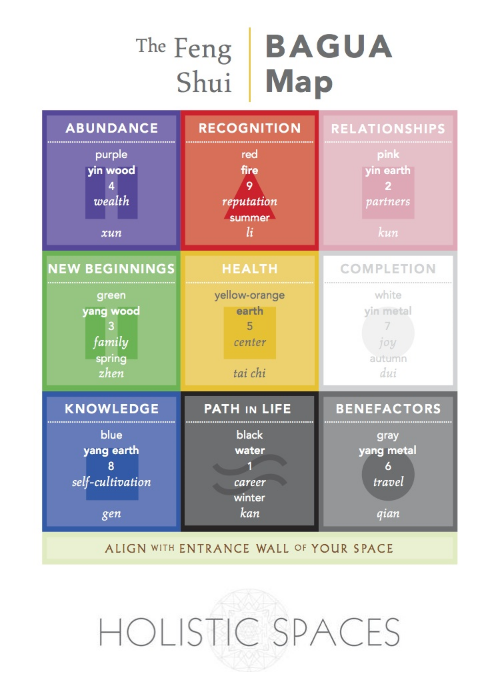 Tune in September 14 for the next Holistic Spaces Podcast: Intro to the Feng Shui Bagua Map!